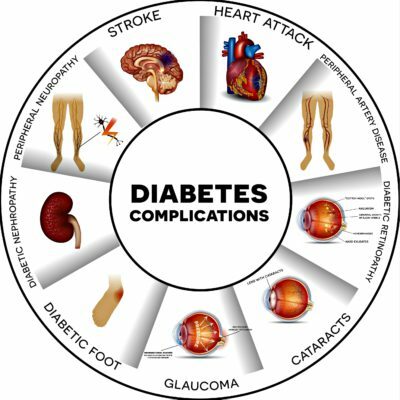 Diabetes and complications-The lifestyle upgradation, added upsurge in environmental hazards and easy victimization to the mental stress; are some of the mainstream reasons for diabetes prevalence. It should be noted that after every 23 seconds, worldwide someone comes to know that he/she is having diabetes. Some people misunderstand it to be a common disease that can be manageable, only if the sugar is being avoided; however people should be aware of the fact that diabetes is rather a perplexed disease that if ignored for a longer period of time may gives rise to variety of complications, such as cardiovascular disorders, stroke, kidney disorders, blindness, erectile dysfunction, as well as limb amputation. The write up has been intended to provide brief information about possible diabetes associated complications and how they can impact our overall well being. Cardiovascular Disorders: – If you are a diabetic, chances of you having vascular diseases may increase 10-15 times more. The coronary artery disease is the most prevalent form of heart trouble, being a diabetic. It has been often observed that chronic diabetes may cause hardening of important arteries, minimizing the blood supply towards heart and brain. This may lead to stroke or cardiovascular disorders. Eye Damage: -Diabetes can be the primary cause of blindness in most of the developed countries. Over the period of time, due to constant rise in blood sugar level and continuous intake of steroidal medicine, the blood vessel supplying blood to the retina of the eye gets damage causing severe blood leakage. The condition is been identified as diabetes retinopathy and it is important to note that almost one in four people with diabetes may get affected with diabetes retinopathy. supplying blood to them. Due to which, a kind of important protein named albumin is leaked into the urine and excreted instead of being conserved by the body. With the progressive damage, the condition named proteinuria increases eventually causing kidney failure. Diabetic Peripheral Neuropathy: – Exposure to higher level of blood glucose over a prolonged period of time may cause severe damage to the peripheral nerves that are being spread to the limbs, all over the body. The said problem if ignored with its some of the common symptoms, such as tingling sensation in the limbs, numbness, etc. can apparently increase the risk of limb amputation. Anxiety & Depression: – Although little is being related between anxiety and diabetes, people should know that diabetes is the major reason for anxiety, may be due to the poor blood sugar regularization and critical blood supply to some of the important organs of the body, including brain. Thus, although disease is single but its complications are unlimited and hence it is very crucial to manage it without many flare ups. At the same time, the research has suggested possible ignorance towards long term consumption of steroidal anti-inflammatory medications for managing the ailment; instead people are attempting to accept alternative mode of treatments that are being made accessible through scientific and technological upgradation, such as stem cells treatment. The loads of data compiled thorough different clinical studies have suggested possible potential of stem cells treatment as a new effective, drug free alternative to manage diabetes.